Hatchet staff writer Margaret Kahn discusses her most recent cinematic experience. 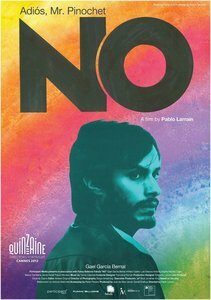 The opening scenes of “No,” depicting the violent and militarized streets of Santiago, may shatter your preconceived notions of Chile, the idyllic South American country popular with students studying abroad. Those images, however, will stay with you long after the credits roll. Directed by Pablo Larraín, the film has been one of the most buzzed-about international films since it showed at last year’s Cannes Film Festival. Now it’s playing at select theaters stateside and the hype is still high. The film tells the true story of the beginnings of the end of the military junta in Chile. In 1988, General Augusto Pinochet’s government, under international pressure, called for a national referendum allowing citizens to vote “yes” or “no” for eight more years of his rule. Gael García Bernal plays Rene Saavedra, a savvy young adman hired with the impossible task of taking down a dictator. Unlike many historical films, the story does not waste time with unnecessary romance or family drama. Rene has a young son with his estranged wife, but their relationship is barely touched upon. That’s not what this movie is about. Instead the audience is asked to think seriously about the history of Chile’s recent past. For audience members, this task could at times be a double-edged sword. While I left the theater feeling like I had learned a lot, I might as well have stayed at home and watched a History Channel docu-drama. The film focuses very little attention on entertainment value and more on educating. There is nothing wrong with this, but at times, it felt like a documentary that hired actors. The film, though fictional, aims for complete and flawless authenticity, and is supported with real footage. The director filmed on vintage Sony U-Matic cameras, which perfectly replicate the look and feel of a 1980s home video. The plot adds little more to the subject than a textbook might. If you’ve taken a Latin American politics classes, you’ll know what’s accurate and what’s not. Students traveling to Chile next year to study abroad should see this movie to get them thinking about the history, then follow-up in-country with the Historical Memory and Human Rights class taught by a former political prisoner to learn the full story. “No” currently plays in D.C. at the Landmark E Street Cinema.